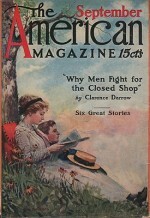 1911, Book: Very Good, Dust Jacket: None, Couple relaxing under a tree in late summer, art by Stanley Arthurs. 7 X 10", very good. Please note: The image shown is a scan of the actual product you are purchasing. What you see is what you get. The sheet may have some imperfections beyond the cropped area shown. You are buying this page only - not the entire magazine. Your order will be placed carefully between stiff paper and an acetate overlay, then packed in a rigid cardboard sleeve to prevent bending. Shipping is free and we will email a delivery conformation when your order is shipped. 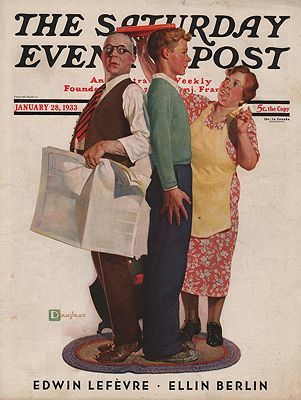 1933, Book: Very Good, Mom measuring son's height against his father, art by Douglas Crockwell. 10 x 13", very good. 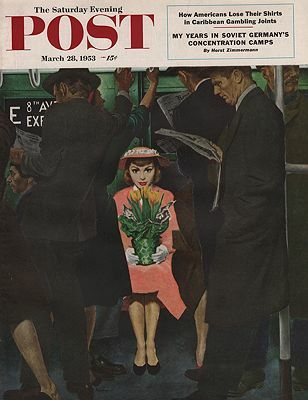 1935, Book: Very Good, Dust Jacket: None, Woman complaining to bored railroad agent about train schedule, art by Harry Beckhoff. 10 1/2 X 13 1/2", very good. Please note: The image shown is a scan of the actual product you are purchasing. What you see is what you get. The sheet may have some imperfections beyond the cropped area shown. You are buying this page only - not the entire magazine. Your order will be placed carefully between stiff paper and an acetate overlay, then packed in a rigid cardboard sleeve to prevent bending. Shipping is free and we will email a delivery conformation when your order is shipped. 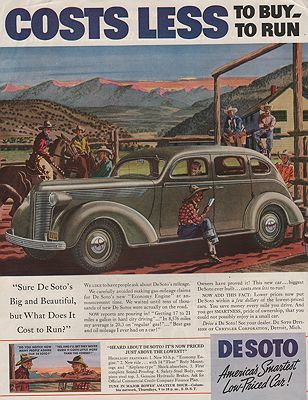 1937, Book: Very Good, Art "Costs less to buy - to run", color art by Leslie Saalburg. !0 x 13.5", very good. 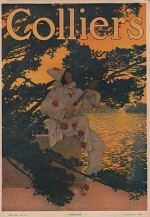 1908, Book: Very Good, Dust Jacket: None, Pierrot playing musical instrument, art by Maxfield Parrish. 10 1/4 X 14 1/2", faint crease down middle, very good. Please note: The image shown is a scan of the actual product you are purchasing. What you see is what you get. The sheet may have some imperfections beyond the cropped area shown. You are buying this page only - not the entire magazine. Your order will be placed carefully between stiff paper and an acetate overlay, then packed in a rigid cardboard sleeve to prevent bending. Shipping is free and we will email a delivery conformation when your order is shipped. 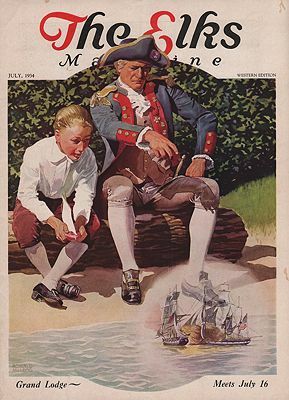 Naval warfare with miniature ships, art by Ronald McLeod. 8 1/2 X 11", very good. 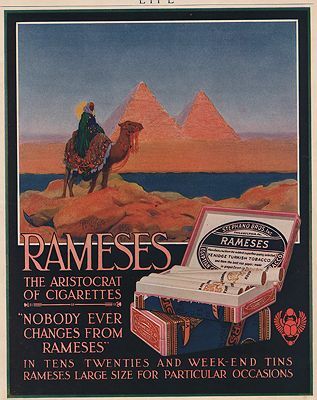 Egyptian scene, art not credited, 9 x 11", very good. 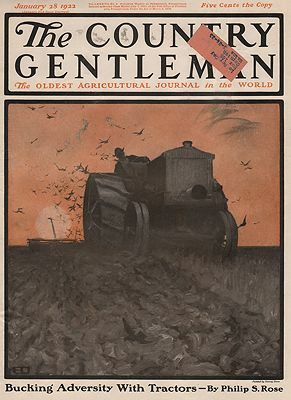 Tractor plowing at dawn, two-color art by Harvey Dunn. 11 x 13.5", very good. Mailing label. 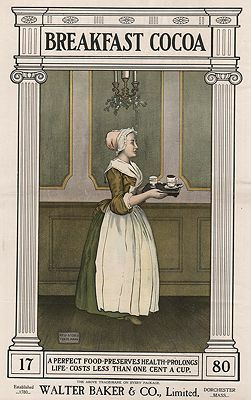 1899, Book: Very Good, Art "A Perfect Food", color art not credited. 12 x 15", very good. 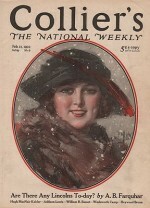 1922, Book: Very Good, Dust Jacket: None, Woman with feather hat and fur stole in falling snow, art by Will Grefe. 10 1/4 X 13 1/2", very good. 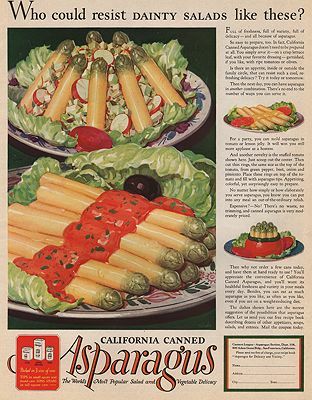 Please note: The image shown is a scan of the actual product you are purchasing. What you see is what you get. The sheet may have some imperfections beyond the cropped area shown. You are buying this page only - not the entire magazine. Your order will be placed carefully between stiff paper and an acetate overlay, then packed in a rigid cardboard sleeve to prevent bending. Shipping is free and we will email a delivery conformation when your order is shipped. 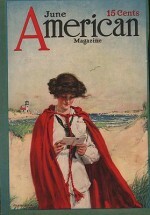 1913, Book: Very Good, Dust Jacket: None, Girl reading letter by the seashore, art by John Rae. 8 X 11", very good. Please note: The image shown is a scan of the actual product you are purchasing. What you see is what you get. The sheet may have some imperfections beyond the cropped area shown. You are buying this page only - not the entire magazine. Your order will be placed carefully between stiff paper and an acetate overlay, then packed in a rigid cardboard sleeve to prevent bending. Shipping is free and we will email a delivery conformation when your order is shipped. 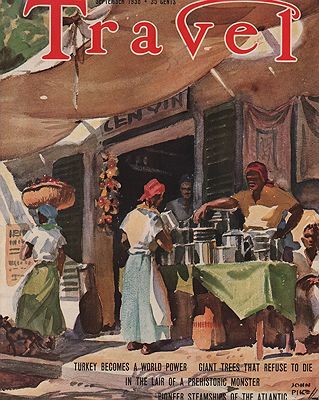 Jamaican street scene, watercolor art by John Pike. 10 1/4 X 13 1/2", very good. 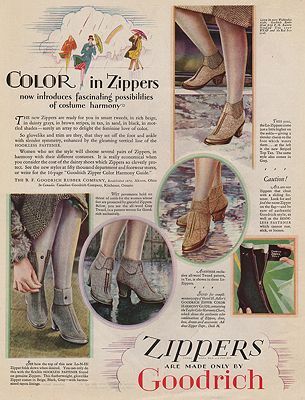 1927, Book: Very Good, Art "Color in Zippers", color art not credited. !0 x 13", very good. 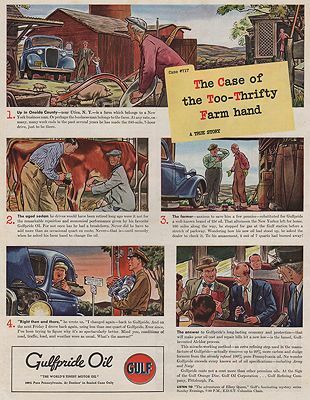 1940, Book: Very Good, Art "The Case of the Too-Thrifty Farm Hand", color comic strip art by James Williamson. 10 x 13.5", very good. 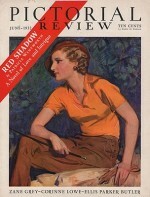 1932, Book: Very Good, Dust Jacket: None, Portrait of seated woman in riding clothes. 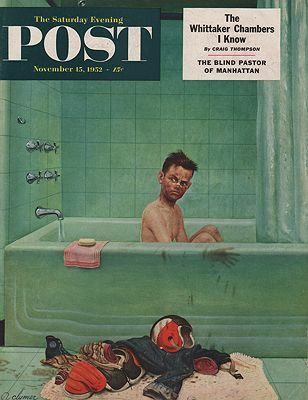 art by McClelland Barclay. 10 1/2 X 13 1/2", very good. Please note: The image shown is a scan of the actual product you are purchasing. What you see is what you get. The sheet may have some imperfections beyond the cropped area shown. You are buying this page only - not the entire magazine. Your order will be placed carefully between stiff paper and an acetate overlay, then packed in a rigid cardboard sleeve to prevent bending. Shipping is free and we will email a delivery conformation when your order is shipped. 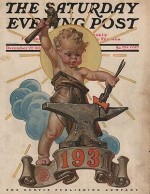 1930, Book: Very Good, Dust Jacket: None, New Year's baby forging 1931 on an anvil, art by J.C. Leyendecker. 10 1/2 X 13 !/2", very good. Please note: The image shown is a scan of the actual product you are purchasing. What you see is what you get. The sheet may have some imperfections beyond the cropped area shown. You are buying this page only - not the entire magazine. Your order will be placed carefully between stiff paper and an acetate overlay, then packed in a rigid cardboard sleeve to prevent bending. Shipping is free and we will email a delivery conformation when your order is shipped. 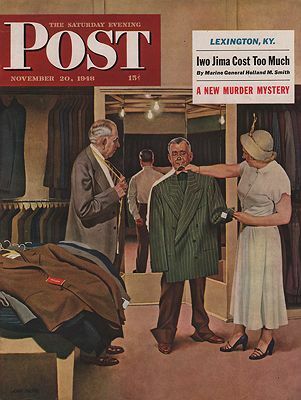 1948, Book: Very Good, Husband shopping for a suit with his wife, art by John Falter. 10 x 13", very good. 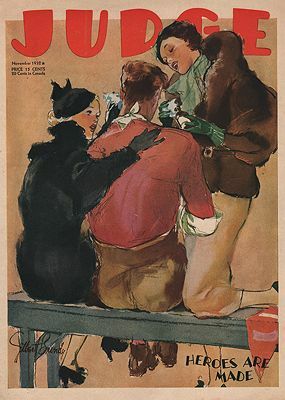 Two beautiful ladies consoling football player on bench, art by Gilbert Bundy. 8.5 x 11", very good. 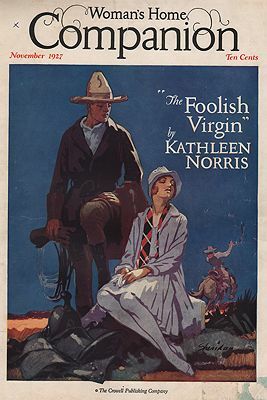 Couple in evening western setting, art by John Sheridan. 11.5 x 14", very good, light soil, mailing label. 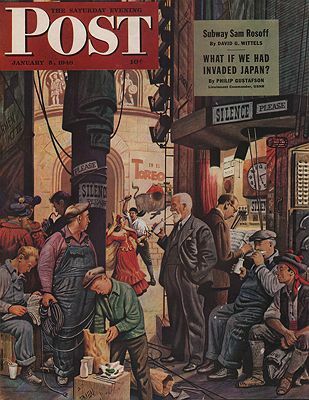 1946, Book: Very Good, Backstage scene at the theater, art by John Falter. 10 x 13", very good. 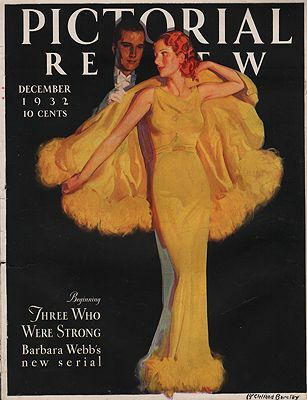 Woman in yellow evening wear, art by McClelland Barclay. 11 X 14", very good. 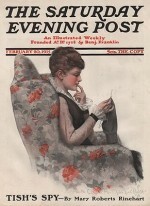 1918, Book: Very Good, Dust Jacket: None, Woman in high-backed chair, sewing patch work, art by Neysa McMein. 10 1/2 X 13 1/2", very good. Please note: The image shown is a scan of the actual product you are purchasing. What you see is what you get. The sheet may have some imperfections beyond the cropped area shown. You are buying this page only - not the entire magazine. Your order will be placed carefully between stiff paper and an acetate overlay, then packed in a rigid cardboard sleeve to prevent bending. Shipping is free and we will email a delivery conformation when your order is shipped. 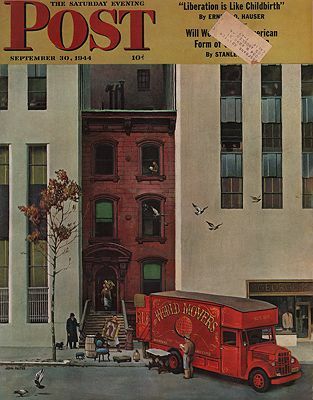 1944, Book: Very Good, Moving day with truck loading up furnishings from old building squeezed between modern skyscrapers. 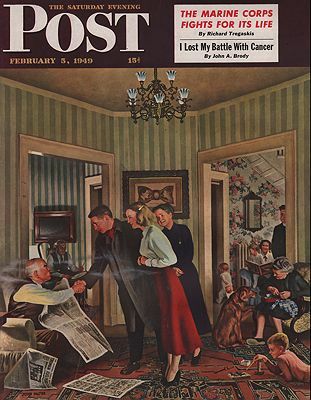 Art by John Falter. 10 x 13", very good, mailing label. 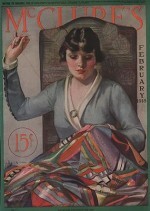 1915, Book: Very Good, Dust Jacket: None, Woman knitting sock, art by Chas, McClellan. 10 1/2 X 13 1/2", very good. Please note: The image shown is a scan of the actual product you are purchasing. What you see is what you get. The sheet may have some imperfections beyond the cropped area shown. You are buying this page only - not the entire magazine. Your order will be placed carefully between stiff paper and an acetate overlay, then packed in a rigid cardboard sleeve to prevent bending. Shipping is free and we will email a delivery conformation when your order is shipped. 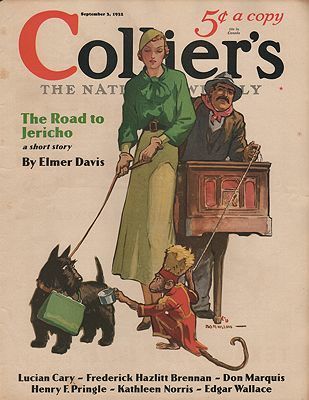 1932, Book: Very Good, Scottie being walked by woman, getting pan-handled by organ-grinder's monkey. 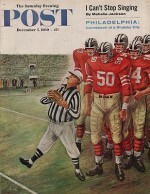 Art by Jay Hyde Barnum. !0 x 13", very good. 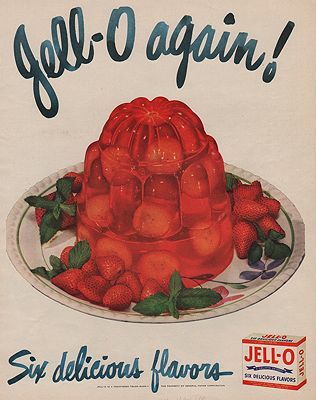 1948, Book: Very Good, Art "Jeii-O Again! ", color art not credited. 10 x 13.5", very good. 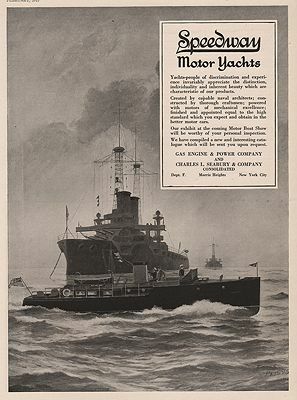 1917, Book: Very Good, Dust Jacket: None, Motor yacht passing in front of naval ship, b&w illustration by Frank Paul. Announcing their line for the upcoming Motor Boat Show. 10 x 13", very good. 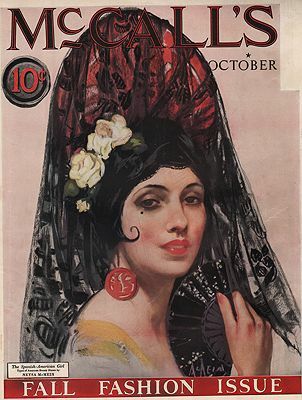 The Spanish-American Girl, art by Neysa McMein. 12 X 15" ", very good. 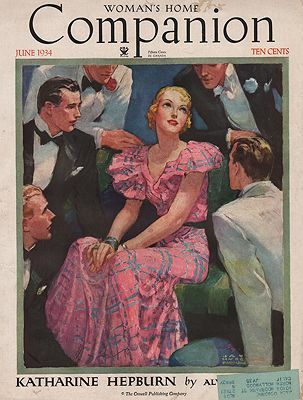 Girl surrounded by male suitors, art by Jay Hyde Barnum. 11 x 13.5", very good. Mailing label. 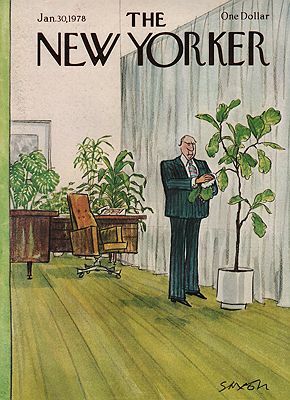 Executive cleaning his office plants, cartoon art by Charles Saxon. 9 x 11", very good. 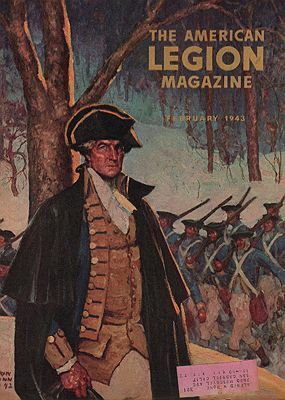 1943, Book: Very Good, Portrait of George Washington, soldiers in background. 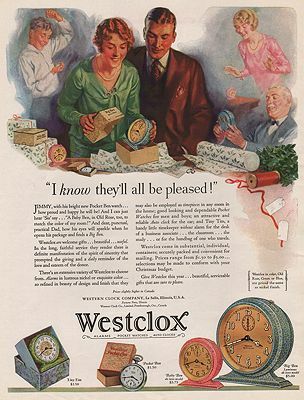 8 x 11", very good, mailing label. 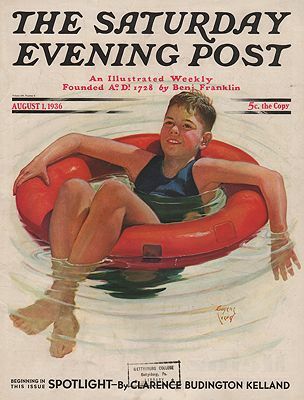 Boy floating in inner tube, art by Eugene Iverd. 10 1/4 X 13 1/2", very good. Mailing stamp. 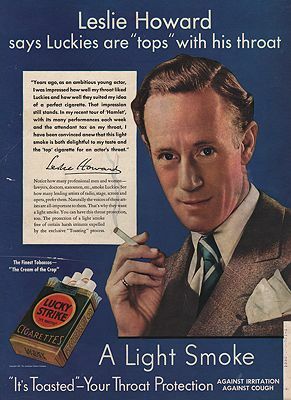 1937, Book: Very Good, Art "Leslie Howard says Luckies are tops...", color photo of the movie star. 10 x 13.5", very good. 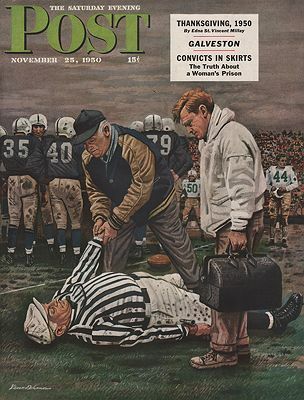 1959, Book: Very Good, Dust Jacket: None, Football referee walking off penalty, art by Constantin Alajalov. 10 1/2 X 13 1/2", very good. Please note: The image shown is a scan of the actual product you are purchasing. What you see is what you get. The sheet may have some imperfections beyond the cropped area shown. You are buying this page only - not the entire magazine. Your order will be placed carefully between stiff paper and an acetate overlay, then packed in a rigid cardboard sleeve to prevent bending. Shipping is free and we will email a delivery conformation when your order is shipped. 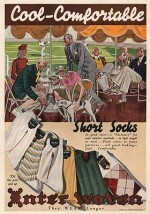 1929, Book: Very Good, Art "I know they'll all be pleased", color art not credited. !0 x 13", very good. 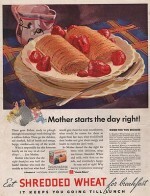 1930, Book: Very Good, Dust Jacket: None, Art "Mother starts the day right", color art of cereal not credited. 10.5 x 13.5", very good. Please note: The image shown is a scan of the actual product you are purchasing. What you see is what you get. The sheet may have some imperfections beyond the cropped area shown. You are buying this page only - not the entire magazine. Your order will be placed carefully between stiff paper and an acetate overlay, then packed in a rigid cardboard sleeve to prevent bending. Shipping is free and we will email a delivery conformation when your order is shipped. 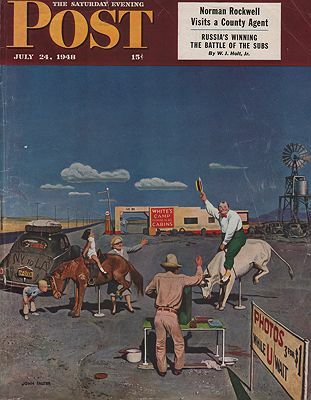 1948, Book: Very Good, Family posing for photos at a tourist stop. 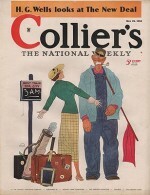 Color art by John Falter. 10 x 13", very good. 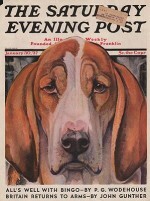 1937, Book: Very Good, Dust Jacket: None, Portrait of beagle, color art by Paul Bransom. 10 1/4 X 13 1/2", very good. Mailing label. Please note: The image shown is a scan of the actual product you are purchasing. What you see is what you get. The sheet may have some imperfections beyond the cropped area shown. You are buying this page only - not the entire magazine. Your order will be placed carefully between stiff paper and an acetate overlay, then packed in a rigid cardboard sleeve to prevent bending. Shipping is free and we will email a delivery conformation when your order is shipped. 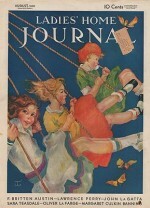 1930, Book: Very Good, Dust Jacket: None, Three little girls on swings, art by Robert Lee. 10 1/2 X 13 1/2", mailing label. Please note: The image shown is a scan of the actual product you are purchasing. What you see is what you get. The sheet may have some imperfections beyond the cropped area shown. You are buying this page only - not the entire magazine. Your order will be placed carefully between stiff paper and an acetate overlay, then packed in a rigid cardboard sleeve to prevent bending. Shipping is free and we will email a delivery conformation when your order is shipped. 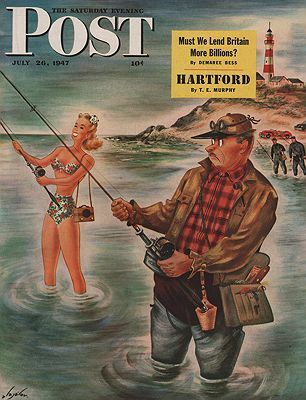 Bathing beauty fishing in surf next to old-school fisherman, art by Constantin Alajalov. 10.5 x 13.5", very good. 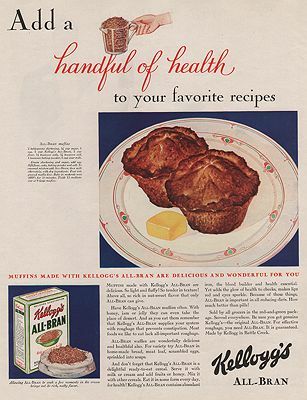 1930, Book: Very Good, Art "Add a handful of health", color art of muffins not credited. 10 x 13", very good. 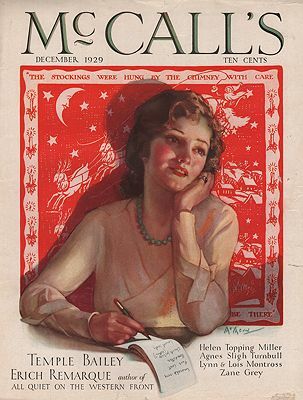 Woman compiling Christmas wish list, art by Neysa McMein. 11 X 14", very good. 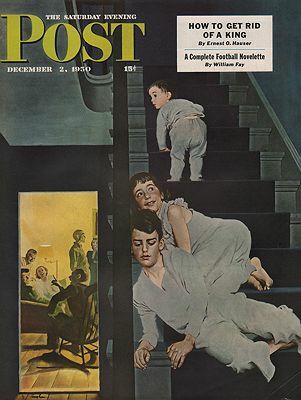 Kids on stairwell eavesdropping on adults in living room, art by George Hughes. 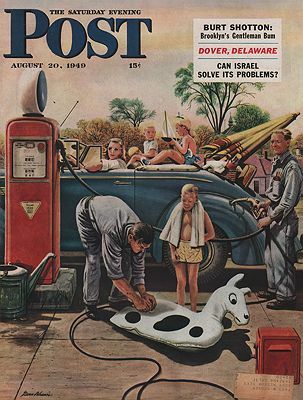 Blowing up inflatable seahorse at the gas station, art by Stevan Dohanos. 10.5 x 13.5", very good.